Winthrop has a town beach, boat landing and picnic area – Norcross Point – which is a regular site for weddings, birthday parties and other events. The area’s lakes, trails and mountains afford summer and winter fun for swimmers, boaters, hikers, snowmobilers and cross-country skiers. 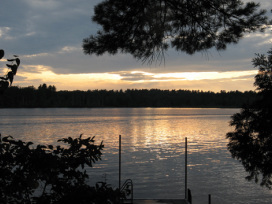 There are several family and children’s camps nearby including the Maine Conference U.C.C. (Pilgrim Lodge), the State YMCA Camp and a United Methodist Camp (Mechuwana). Recreational opportunities abound. Our schools consistently rank among the best in the state. Winthrop High School has been named in the “Top High Schools in the State of Maine” by U.S. News & World Report’s America's Best High Schools Annual Report. The region’s strong health-care offerings took a major step forward in November 2013 when MaineGeneral Medical Center opened a new, $314 million hospital in Augusta. It is located next to the Alfond Center for Cancer Care, which opened in 2007 and is ranked nationally for its level of care. Not surprisingly, recruitment of medical professionals is on the upswing, a potential growth area for our community and congregation. Winthrop preserved a key part of its downtown history in 2005 by converting the former Carleton Mill building into a health center with radiology and laboratory services, family physicians’ and pediatricians’ offices. Two other full-service hospitals –Central Maine Medical Center and St. Mary’s Regional Medical Center – are located in Lewiston. Winthrop has dentists, chiropractors and veterinarians. Many excellent colleges are within commuting distance: Bates, Bowdoin, Colby, Thomas and University of Maine campuses at Farmington and Augusta. Retail shopping abounds in Augusta and Lewiston. Winthrop is a sports-oriented community. The grade school and YMCA collaborate to offer sports programs for young children year-round. The middle and high schools have competitive sports teams that enjoy broad support. The high school also is known for its art, drama and Latin programs, among others. The Winthrop Performing Arts Center, which opened with our high school in 2003, offers many cultural opportunities, including public concerts, plays and community celebrations. Within a 10-minute ride from Winthrop is the Theater at Monmouth, a vibrant Shakespearean Theater that draws crowds each summer. Winthrop is less than 90 minutes from top ski resorts (Sunday River, Sugarloaf), an hour from the coast and an hour from Portland, Maine’s largest city, and the Portland Jetport. Boston is three hours away. Amtrak’s Downeaster rail line, connecting Maine to Boston and points south, extends north to Brunswick, a 20-minute drive. Our town has a rich history, in which our congregation has played a central role for nearly two centuries. During the summer of 1776, while other men were meeting in Philadelphia, a group of men and women were holding meetings to organize a church for the isolated but growing community of “Pond Town.” Their efforts came to fruition on Sept. 4, exactly three months after the signing of the Declaration of Independence. The first services were held at a local tavern, Squire Bishop’s Inn. In June 1825, the Masonic Lodge of Winthrop (Temple) laid the cornerstone of the Congregational Church on what is now upper Main Street. This was the site of the Church for many years. In 1861, a chapel was built in the center of town, at the present home of the Congregation. Renovation of the fellowship hall was completed in 1904, at which time the large building on upper Main Street was sold. In 1967, the congregation became part of The United Church of Christ. With the help of bequests and fund drives, the church building expanded in 1975 and became handicapped accessible in 1996. In 2013, by unanimous vote, we became an Opening and Affirming Church.